Never has the situation in the Balkans been so “pre-war”, GERB leader Boiko Borissov told an election meeting on March 15, saying this was why his party had to win the elections so that Bulgaria could remain “an island of stability in Europe”. With only less than a week and a half remaining in campaigning ahead of Bulgaria’s early parliamentary elections, tensions with Turkey and relations with Russia are recurring themes for several political parties. The campaigns are being fought against a background of severe difficulties in a number of Bulgaria’s neighbouring countries in South Eastern Europe, and while Erdoğan’s Turkey is ratcheting up tensions with several countries to the west of it, including Bulgaria. At an election meeting in Plovdiv, Borissov – twice a former prime minister and pursuing a return to power at the head of his centre-right party – said that the March 26 elections were crucial to the future of Bulgaria, because unless a stable government was created, the country would enter into a spiral of elections and political crises of the kind happening in other European countries. 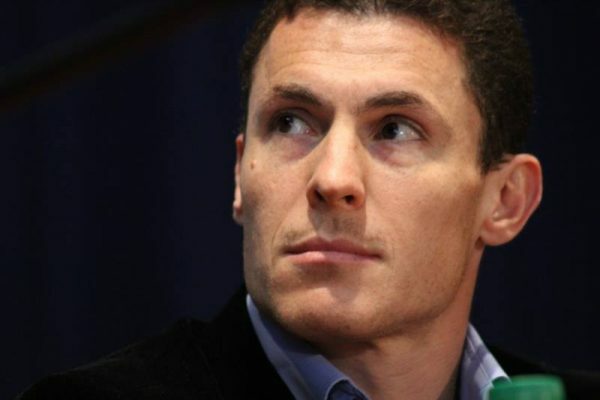 He pointed to the Republic of Macedonia, which so far has been unable to form a government after December elections. “Greece’s credit rating is junk. Never has the situation in the Balkans has been so pre-war. Therefore GERB must win the election, for Bulgaria to remain an island of stability in Europe,” Borissov said, adding that “in Greece, there are more than 70 000 migrants, and in Bulgaria, zero”. (Fact check: It is not immediately clear to what numbers Borissov is referring. An International Organization for Migration regular report on March 12 indeed showed no arrivals of migrants and refugees in Bulgaria between February 27 and March 6. If that is what Borissov is talking about, the same report shows migrant and refugee arrivals in Greece in the same period as adding up to 492. A report by Bulgaria’s State Agency for Refugees said that in January 2017, 421 people from 14 countries applied for protection in Bulgaria; 34 from one country were granted humanitarian status). Borissov said that if relations between Europe and Turkey worsened, “there may be big consequences for not only business, not only regarding migrants, but also for trade”. There was a risk from the Turkish threat that three million refugees would be allowed to leave Turkey to come to Bulgaria, he said. “We are on the border and I am very worried. That is why we must hold fast to Europe and the EU, we have to keep to the rules,” he said. Borissov said that the European Commission is proving that it protects the rights of Bulgaria, citing as examples the contracts with Gazprom and South Stream, the planned Balkan gas hub and the price of gas. Borissov said that there was powerful penetration and engagement on the part of Turkey in the form of its diplomats and Lyutvi Mestan’s DOST party. “Historically we know what’s next,” he said. Valeri Simeonov, co-leader of the nationalist United Patriots, said in a television interview on March 15 that the reaction of the caretaker government to a Turkish cabinet minister’s campaigning for Mestan’s DOST had been “timid”. “It should be more forceful because this is not a question of a single act, the first of its kind, as with the Netherlands and with Germany, this is a matter of a series of provocative acts being carried out,” Simeonov said. 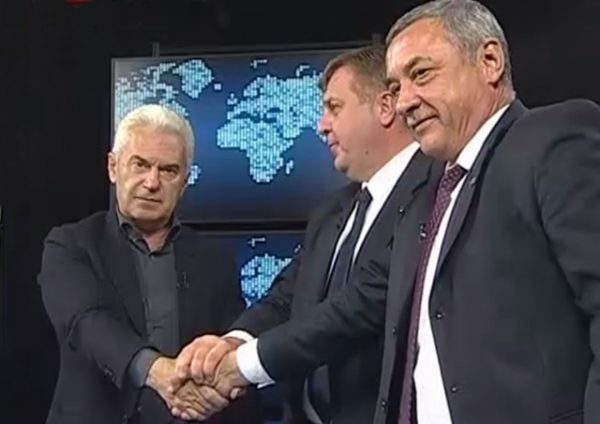 The leaders of the parties in the United Patriots coalition, Volen Siderov, Krassimir Karakachanov and Valeri Simeonov. It had “started with (Turkish ambassador in Sofia, Süleyman) Gökçe, who went around with Lyutvi Mestan at the founding of their structures, and the inappropriate statements regarding Bulgarian territories by Erdoğan,” he said. Every successive government of Bulgaria had suffered from this, and had Bulgaria put its position more clearly, it would not have come to this, Simeonov said. The centre-right New Republic coalition has called for Bulgaria not to open polling stations other than those in diplomatic and consular offices in Turkey. 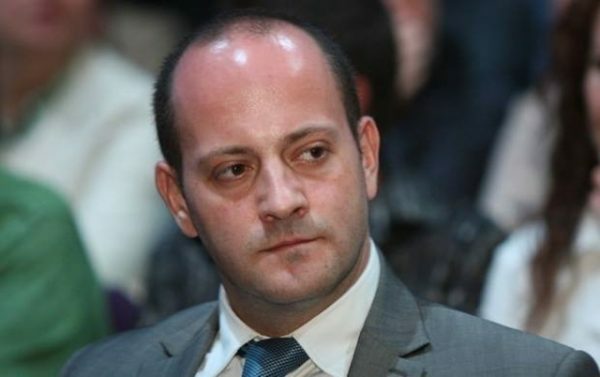 New Republic leader Radan Kanev said that Europe, including Bulgaria, had a problem with Erdoğan pursuing totalitarian rule. Kanev said that caretaker Prime Minister Ognyan Gerdzhikov should “go to Berlin and The Hague, to show solidarity, and require strengthening of the security of the land and sea borders. “There are obvious external threats, we are worried about our border and the danger of migrants, as well as pressure from Turkey on the EU,” Kanev said. The Reformist Bloc-Glas Naroden coalition earlier called on President Roumen Radev and PM Gerdzhikov to “reconsider” the opening of polling stations in Turkey. Socialist ABC leader Konstantin Prodanov said on March 14 that the tension in relations between Europe and Turkey worried him, especially in the context of what was happening in Bulgaria and the election. “What is happening, unscruplously, is a gross interference by an outside power in our domestic politics,” said Prodanov, whose party is in an electoral coalition with Tatyana Doncheva’s socialist Movement 21. “We are witnessing the participation of a foreign ambassador, and this openly in the election campaign of a certain political force. “The financing is from outside, and obviously, secret,” Prodanov said. He said that “although over the years the foreign ambassadors learnt to behave in our country as if they were in some mandated territory, I cannot think of any such rude behaviour in our recent history”. Konstantin Prodanov, leader of the ABC party. He said that while the Netherlands and France stood up for themselves, “here we keep silent. We summoned the Turkish ambassador and I don’t know what else was done. These are palliative measures, but the problem is very serious,” Prodanov said.